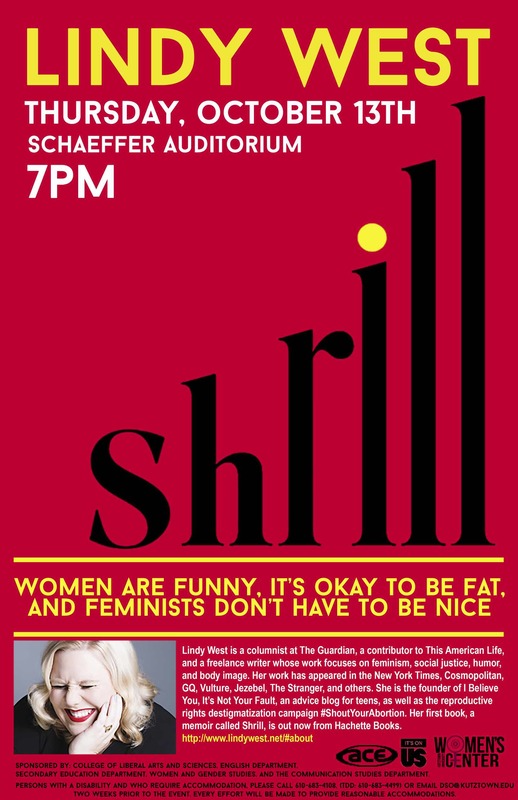 Lindy West is a columnist at The Guardian, a contributor to This American Life, and a freelance writer whose work focuses on feminism, social justice, humor, and body image. Her work has appeared in the New York Times, Cosmopolitan, GQ, Vulture, Jezebel, The Stranger, and others. She is the founder of I Believe You, It’s Not Your Fault, an advice blog for teens, as well as the reproductive rights destigmatization campaign #ShoutYourAbortion. Her first book, a memoir called Shrill, is out now from Hachette Books. West will speak at Kutztown University on Thursday, October 13 at 7 p.m in Schaeffer Auditorium. This event is co-sponsored by the College of Liberal Arts and Sciences, the Department of English, the Department of Secondary Education, Women and Gender Studies, the Department of Communication Studies, ACE, It’s On Us, and the KU Women’s Center.